I’ve lived in Madison for more than six years and have been trying to hit all of the best restaurants, but for some reason I hadn’t been to Graze on the square yet. It had been on my list since moving here but it never worked out to go – there were always other options that worked better. So when my mom came in to town this fall I decided a Friday night dinner at Graze was in order. They don’t take reservations so we got there around 5 to make sure we got a table! It was already humming then and the best tables near the front windows were taken. We got a small table in the middle of the room pushed up against other tables for two, but the view is mostly the same from the entire dining room. There are a lot of things on the menu that Graze is known for, so going into the meal I had an idea what we’d be ordering. We ordered the deviled eggs and fried pickles for appetizers. I was hoping the deviled eggs would be something special or a spin on the traditional Wisconsin deviled eggs. The Graze deviled eggs were good but nothing special. The thing that would make them worth ordering again was the mustard sauce they were sitting on. 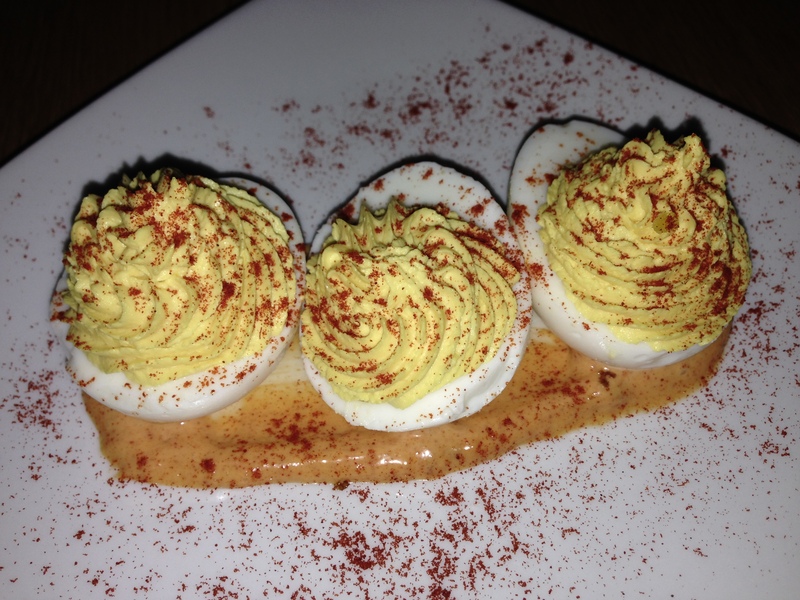 It added a great flavor to the rich deviled eggs. 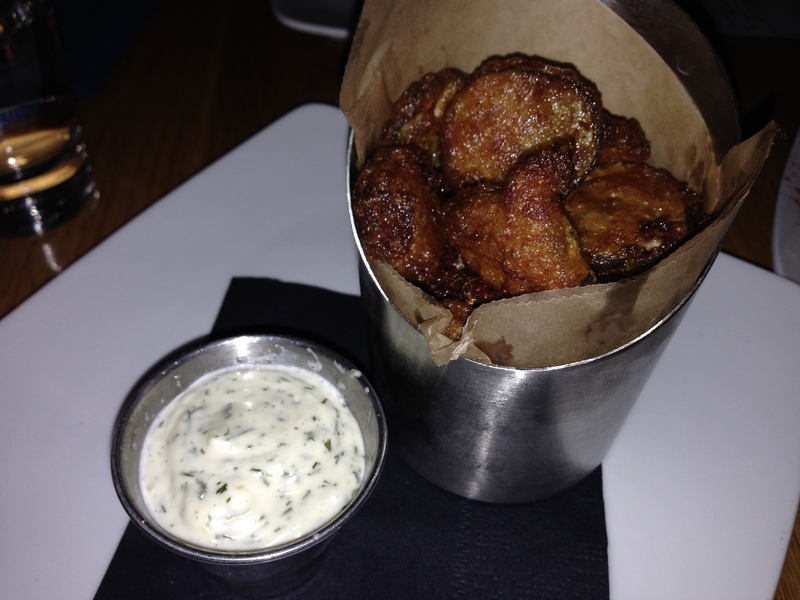 Though the deviled eggs were less than spectacular, the fried pickles lived up to their hype and then some. The pickle chips were perfectly fried and came in a large serving. The batter was not too light or too heavy – it was perfectly salty and crispy. The dill ranch dressing was the perfect dipping sauce for the perfectly-greasy fried pickle chips! I love fried pickles and these are ones to keep going back for! My mom and I like dessert a little less than the average person so we decided to split the roasted beet salad before our main meal instead of getting a dessert. The salad was a perfect choice! It comes with roasted pistachios, Sartori MontAmore cheese, roasted beets and mixed greens topped with a light vinaigrette. We both love beets so this salad was perfect. I was surprised at the large amount of the premium toppings – the beets, pistachios and Sartori cheese! I can’t say enough about this amazing salad – the pistachios added the perfect crunch to the soft roasted beets and the crunchy greens. The Sartori cheese was perfectly sharp and paired well with the light vinaigrette! I will probably be making return trips just for this salad! 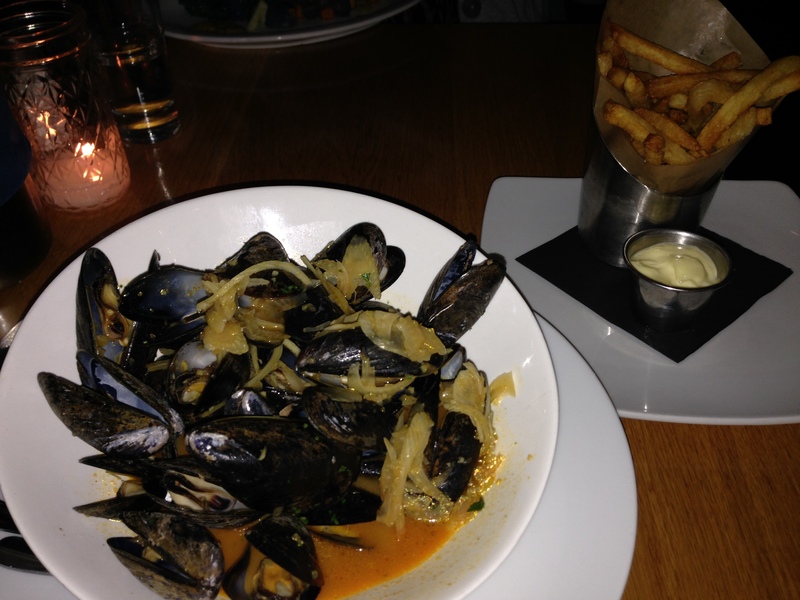 I got the moules frites f0r my main course. The mussels were perfectly cooked with a great fennel and white wine sauce. The light sauce paired perfectly with the super salty and amazingly crispy fries. The fries were served with a garlic aioli and I absolutely loved them! It is a very simple dish but it was prepared perfectly! 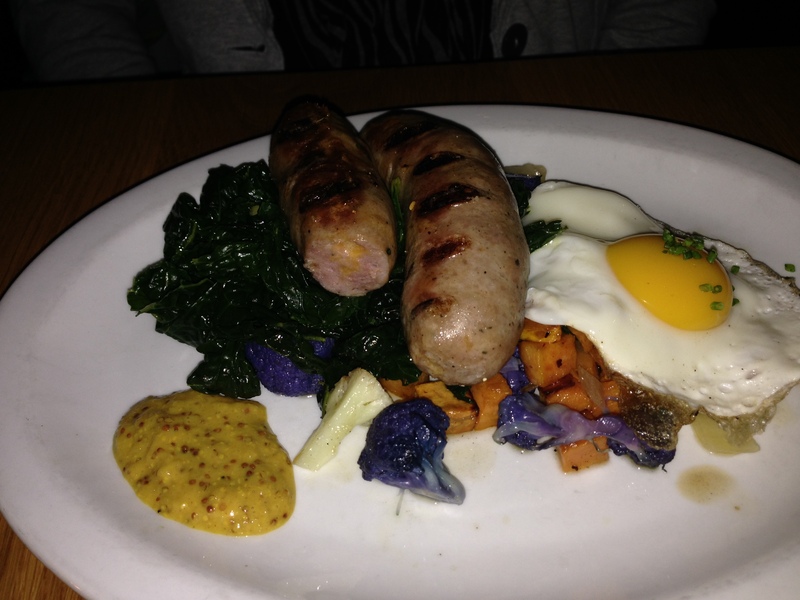 My mom got a dish with house-made sausage, sauteed kale, sweet potatoes and cauliflower, and a sunny-side up egg. The dish also came with hot mustard for the sausages. Everything was cooked perfectly and it got my mom to like sunny-side up eggs for the first. It wasn’t anything too special but it was very good. FOODNOTES: The view alone sells Graze as the place to go when spotlighting Madison as a food-loving town, but some of our choices added to the great night. The deviled eggs and both of our entrees weren’t anything too spectacular but our fried pickles and roasted beet salad were top notch. The fried pickles top my list of best fried pickles I’ve ever tried and will definitely be ordered again! 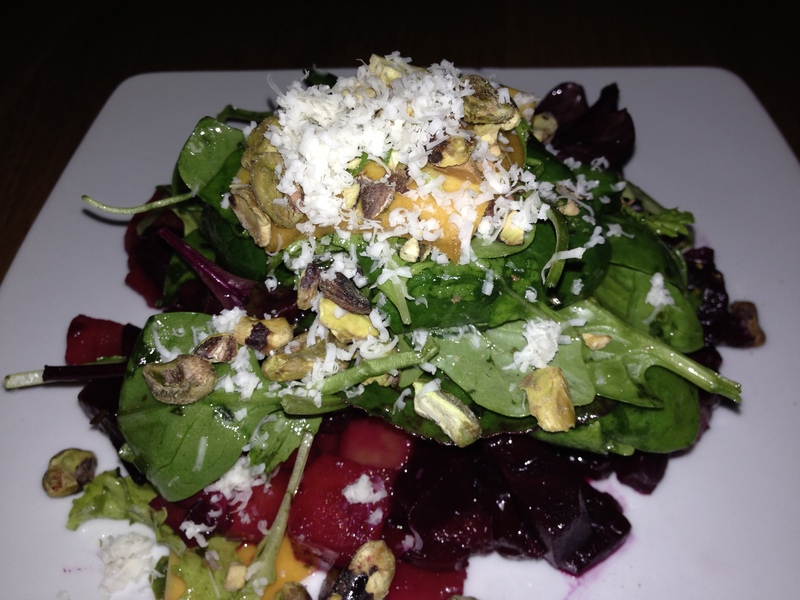 But what will bring me back, other than the view and tempting other dishes to order, is the roasted beet salad! It was simple but spectacular! Prices are what you’d expect for a funky bistro across the street from the Capitol. I would suggest getting there early unless you don’t mind waiting 40 minutes for a table.